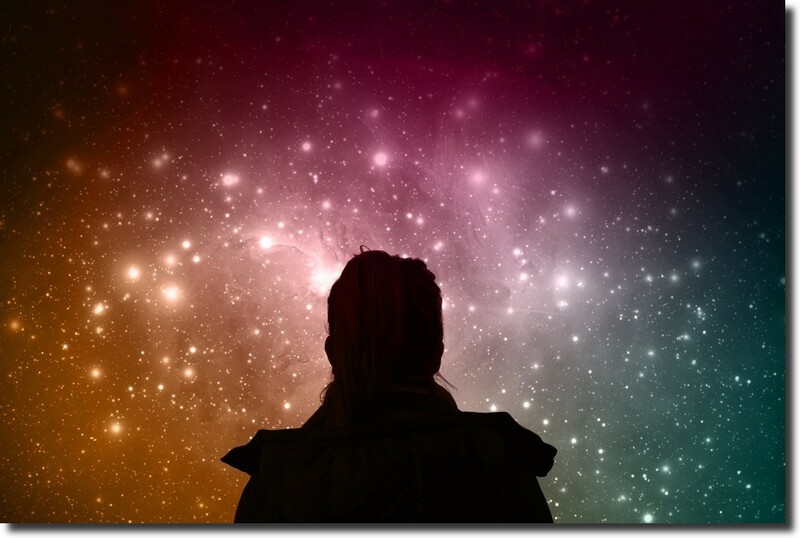 Come back here for religious birthday wishes with the right — and best — dose of spiritual nourishment, if you feel the need to give solace to a birthday boy or girl with a weary soul. 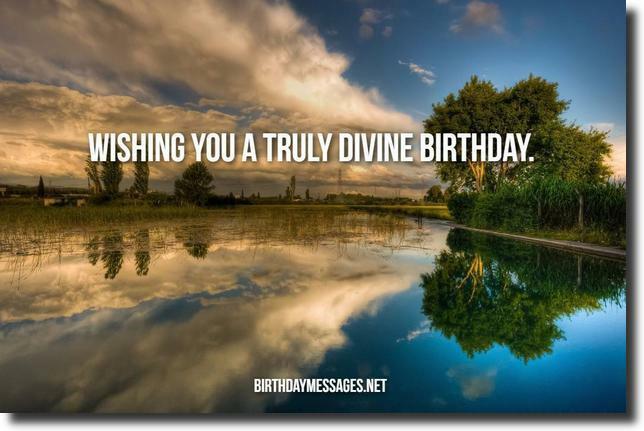 Think of the religious birthday messages on this page as a spiritual reminder that, despite the twists and turns of life, guiding us and giving us strength is a greater power who help us get through every day, especially our birthdays. 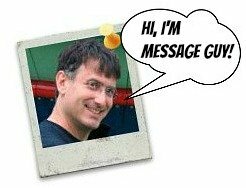 Feel free to send these religious birthday wishes via Facebook, Twitter, Instagram, Snapchat or text. Follow these guidelines and you'll have the opportunity to add true meaning to someone's life...with religious birthday wishes. * This list is based on the article, Seven Spiritual Needs, on takingcharge.csh.umn.edu. Happy birthday. May God bless your life, fulfilling your every birthday wish for joy, health and peace. Happy birthday. May God always bless you and keep you happy, healthy and prosperous. Happy birthday. 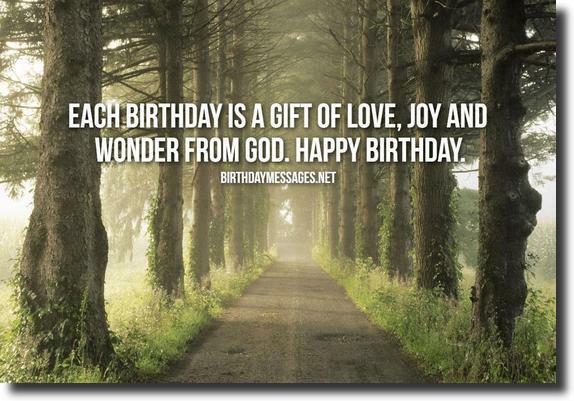 Hope your special day is blessed with God's joy and peace. Happy birthday. You're truly heaven sent by God. Happy birthday. My only prayer today is for you. Hoping your special day is as wonderful as you are. Happy birthday. May you feel God's divine presence today. Happy birthday. May God add many years to your life. Happy birthday. May God shower you with His blessed love today. Happy birthday. May you have many heavenly blessings on your special day. Happy birthday. God is great. And God is kind. He delivered you to me, helping us start a beautiful friendship for life. Happy birthday. May God grant you the strength to live life to the fullest (and, if you still have strength, blow out the multitude of candles on your birthday cake). Happy birthday. May God's grace make your birthday and life beautiful. Happy birthday. May God lighten your load and give you joy. Happy birthday. May God clear your path to true joy, peace and success. Happy birthday. May you receive God's love — today and forever. Happy birthday. Here's to another 365 days of God's heavenly blessings! Happy birthday. 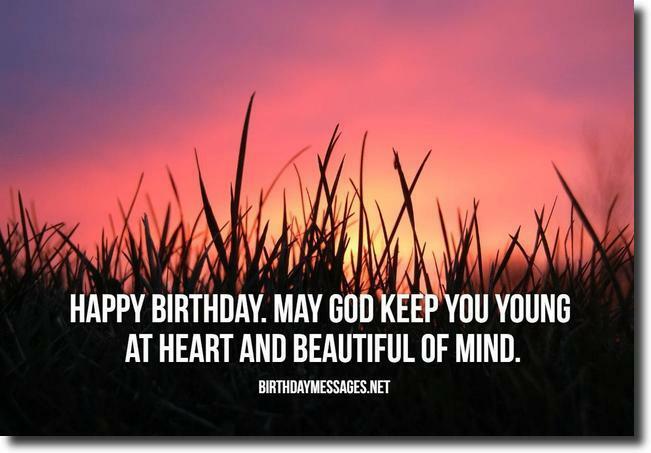 May God fill your birthday and your life with love, kindness, serenity and joy. Happy birthday. On your special day and all year, may God's grace make your birthday wishes come true. What do I like the most about the following three religious birthday wishes? Their message of love, hope and faith, which all adds up to beautiful inspiration. Who could argue with these religious birthday wishes? Not me. Happy birthday. May you include God in your life and, when your time has come, may He include you in his heavenly kingdom. God always gives you a chance at a new life. Your special day is as good as any other to fulfill your true destiny. Happy birthday. Today, your birthday, is God's way of giving you an opportunity to change for the better (whatever "better" means to you and your journey). Happy birthday. Happy birthday. 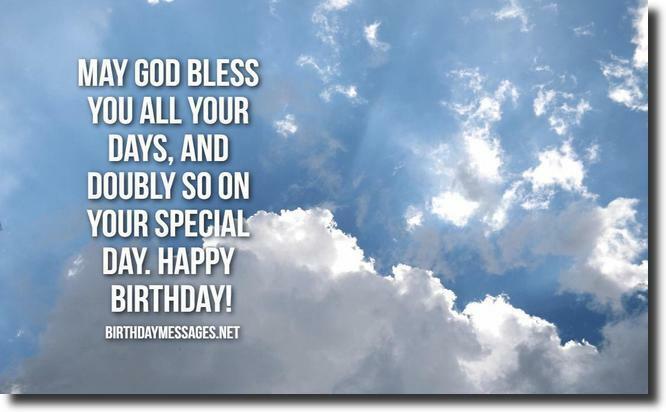 I only have a special prayer for you: may God bless you on your special day. May God bless you and take you on a journey of self-discovery and self-love. Happy birthday. May God share His divine love for you more and more with each and every birthday of yours. Happy birthday. Even if I can't be with you on your birthday, I know that my special prayer for you will make your special day truly divine. Happy birthday. 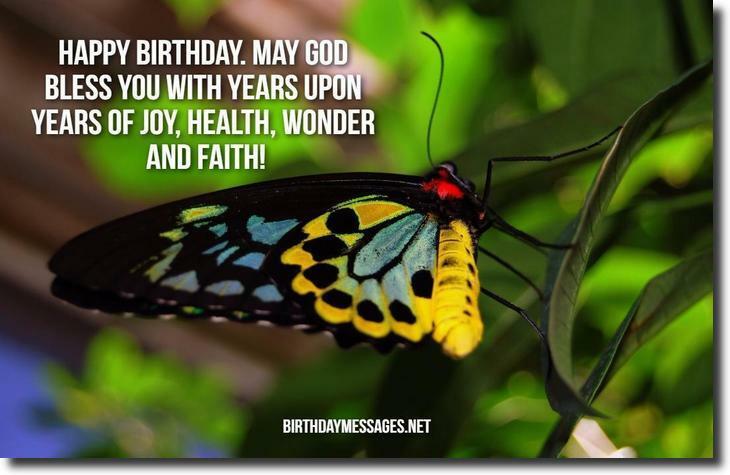 Sending you a truly special birthday wish and a truly special prayer. May God continue to bless you forever. Happy birthday. May God Himself bless you with His undying love, peace and faith. Happy birthday! 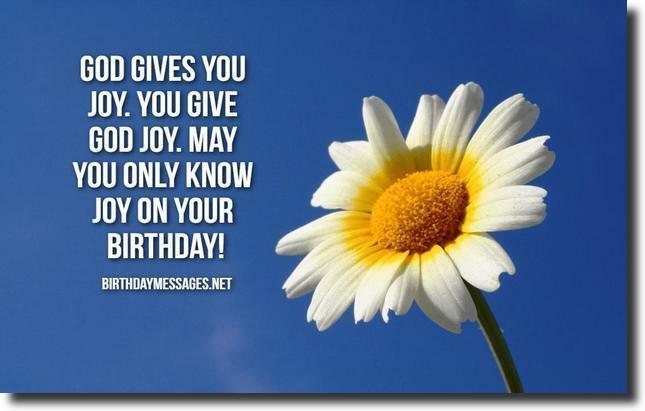 Wishing you the most blessed of birthdays! God created you for a special purpose. It must be to spread your love and joy. Happy birthday! Wishing you a truly divine birthday. May God bless you all your days...and for eternity. You are truly a righteous soul. Happy birthday. Happy birthday to the most righteous person I know. Happy birthday to the most virtuous person I know. My God bless you today, bless you tomorrow, bless you every day. Happy birthday. May God give you strength to be the righteous person you want to be. Happy birthday. May God give you strength to who and what you want to be. Happy birthday. Let only God's faith only give you the positive, peaceful, loving things life has to offer. Let God give you the tools to live a truly successful life. Keep looking for more birthday wishes! Let God give you the love, kindness and faith to make a true success of your life. May God bless you with His great love, faith and kindness on your birthday and everyday. Power and money don't matter to God. What matters is the love, kindness and hope you give the world. And you have plenty to give. Happy birthday! You were made in God’s image and likeness. You are beautiful in every sense of the word. Happy birthday! You and God can definitely make this world an even more beautiful place to live, love and give. Happy birthday! Happy birthday! May God continue to bless the wonderful work you do to bring more love, caring and faith to the world. Happy birthday! May God grant you a full life of love, laughter and beauty. Happy birthday! May God keep you young at heart and free all year round for years upon years. Happy birthday! May you be blessed to remember that every day of your life is a gift from God and His way to make sure you'll never be left wanting. Happy birthday! May God bless you with a special day every year for many, many years to come. Happy birthday. May you always live a virtuous life. Happy birthday. May you only know a wonderfully blessed life ahead, starting with this birthday. May the years to come fill your life with God’s undying and beautiful love and kindness. Happy birthday. Happy birthday. May you only know God's love and kindness the rest of your days. Happy birthday. May you have at least one blessing each and every day, for the rest of your life! Happy birthday. Be grateful for the blessings you've received from God. Have faith you'll be blessed many more times during your life. Happy birthday. On your special day, celebrate the life and happiness God has given you! What better day to do so. May God always bless you with only the most wonderful things life can offer you. Happy birthday. Remember that God is always by your side, on your special day and every day of the year, during the best and worst of times in your life. You can depend on Him. Have a wonderful birthday full of love, faith and peace. May you only find peace, love and hope in everything you do and search for. Happy birthday.